Quick and effortless creation of presentations. Is there a better alternative to 1000 Slides? Is 1000 Slides really the best app in Presentation Tools category? Will 1000 Slides work good on macOS 10.13.4? 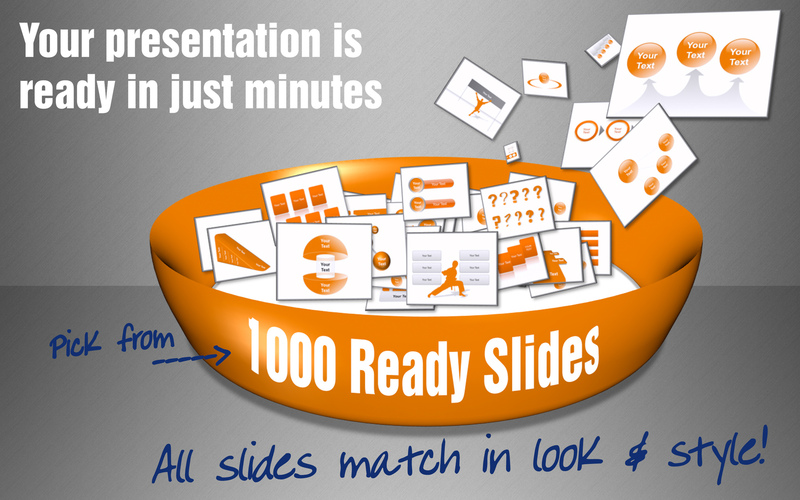 1000 Slides lets you create presentations with PowerPoint or Keynote in just minutes instead of hours. Find over 1000 premium 3D PowerPoint and Keynote templates in one striking look and style! (You get 6x150 templates for free.) While the other templates apps in the App Store are offering you only nice color pictures for your cover and some decoration, here you find 1000 real slide templates in 6 modern preset colors to convey your messages. 1000 Slides needs a review. Be the first to review this app and get the discussion started! 1000 Slides needs a rating. Be the first to rate this app and get the discussion started! With this light-Version you get 150 deluxe-templates for Free! * License Note: This is a computer-based license! The software may be executed on only one computer at a time. A computer-based license is tied to a single computer with single or multiple users. You can transfer the software between computers by first uninstalling it from the original computer. If you have any questions, feedback, or bug reports, please send them to: info@1000slides.com.